The Kawagoe English Walkers is a group of fully independent volunteers who are willing to guide people new to Kawagoe City to Kawagoe’s many wonderful spots. We can guide you around in Kawagoe at your request. * The Kitain Temple （喜多院） with a beautiful Japanese waterless garden (枯山水）, the only remaining buildings of the old Edo-jo Castle (江戸城）, and the 540 interesting stone statues representing Buddha’s desciples (五百羅漢）, etc. * The Kurazukuri daubed houses (蔵造り）, very Kawagoe-like 100% fireproof buildings which remain, not as remains of the past, but as the actual working places of modern-day people. *The Time Bell Tower (時の鐘）; the alley lined with shops selling cheap sweets (菓子屋横丁）; many temples （寺） and shrines（神社）;Honmaru Goten （本丸御殿）Museum; Kawagoe Festival (川越祭り） every second weekend of October; and many other events all through the year. FREE OF CHARGE: Please pay us for the actual expenses such as admission fee, meals, etc. during the service. We, the Kawagoe English Walkers are happy to share our time with visitors, talking and walking in our city, Kawagoe, where history lives. 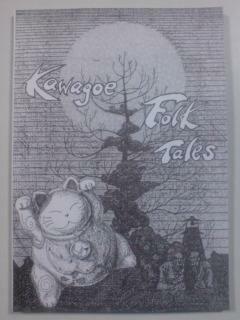 In addition, we have translated some of the local falktales into English and have published a book of “Kawagoe Folk Tales (川越の伝説　\525)”. By doing this, we hope to give another dimension to the other more formal information and to cover other aspects of Kawagoe’s rich culture. You can visit the spots where the settings for the tales were laid if you like. 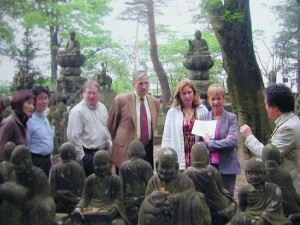 We are eager to learn a lot about foreign cultures as well as Japanese culture through meeting and guiding visitors. Why not visit Kawagoe and make happy memories with us?